Posted in: *Silver Alert*, Media Release. Tagged: Swain. UPDATE: 06/04/18 11:20 pm | Subject has returned home and is safe. Franklin Police have issued a *SILVER ALERT* for 64-year-old Billy Lauderdale. Lauderdale was last seen driving a 2009 black Chevy Suburban with Tennessee license plate 1660 VU. He was last seen at 10am, at his Westhaven residence. Mr. Lauderdale becomes easily confused and has a history of becoming extremely lost. He may be wearing a red striped polo. 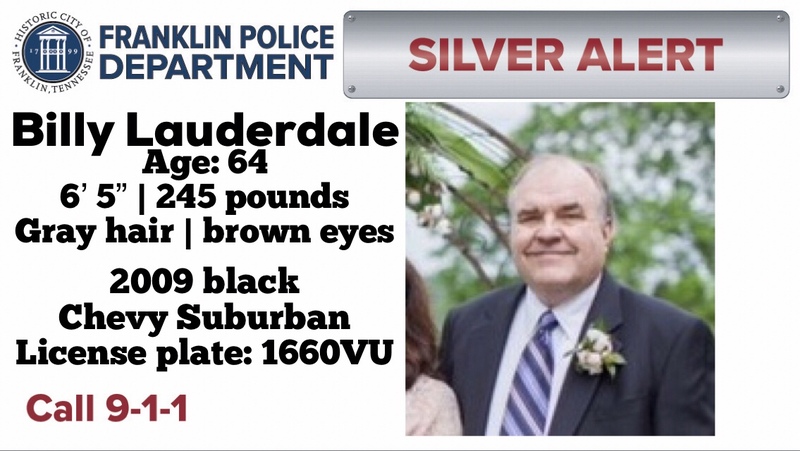 If you see Mr. Lauderdale, or have information on his whereabouts, call 9-1-1.